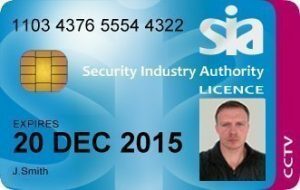 If you’re planning to work as a CCTV officer or working in a role that involves monitoring public space you will require a SIA CCTV licence. A Public Space Surveillance (CCTV) licence is mandatory if you are performing this activity as a contractor or if you are working for a security company or sub contracting. Remember you could actually be committing a criminal by carry out the role of a CCTV operator without a CCTV licence. Who needs a SIA CCTV Licence? The Public Space and Surveillance (CCTV) licence is required when manned guarding activities are carried out useing closed circuit television equipment for activities like monitoring members of the public in a public or private place, or to identify a particular person. This includes the use of CCTV in these cases to record images that are viewed on non-CCTV equipment. So if you would like to book your CCTV course today get in touch! How much does the CCTV licence cost? CCTV licences cost £220 and they last for three years. You may be able to claim tax relief against it if you are a self employed CCTV Operator. Security companies often pay the licence fee on behalf of employee’s as there is no tax or National Insurance liability. You may be entitled to a 50% discount if you already have an SIA CCTV licence and you are applying for an additional license. During the CCTV course we will teach you the essential skills and key terminology you need to get started as a CCTV officer in private security industry. The SIA can attach to the licence any conditions they believe to be reasonable. You must renew your licence before it expires to continue working. You can apply to renew your licence up to 4 months before your current licence expires. Licencing officers contracted by the SIA periodically authorise personnel to enter places of business or work to assess your compliance with any ongoing obligations. You may also have to provide any relevant documents or information to show your compliance with any CCTV regulations like GDPR. Here at In2 security training our mission is to provide the best value CCTV courses in the security industry. Because we have SIA training centres all over the country were well equipped to find the closest CCTV course to suite you. We use innovative education programmes that are all inclusive with no hidden fees or costs. Furthermore we will help you to develop your CCTV career. Upon completion of your level 2 CCTV course we will work with you to gain employment in a licensable role. In2 security training continually strive to improve your experience, ensuring our customers have a time to remember.